Tablets haven't gone away... I don't use one myself, but I still see the appeal for the device around the house. The new Tab S3 adds some real workplace options to really get you to pick it up and use it. 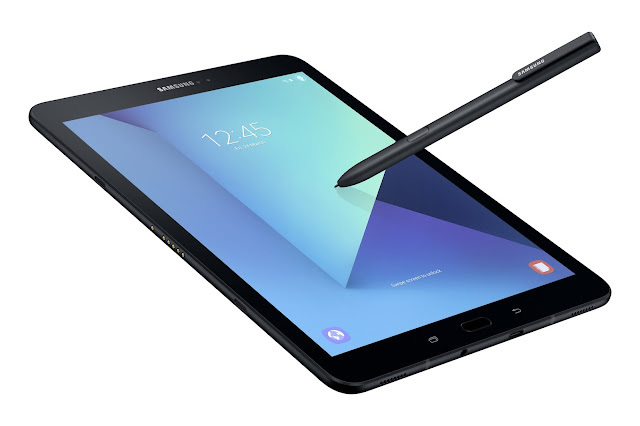 The Galaxy Tab S2 was a very neat tablet, even though it was in the 4:3 ratio I didn't like. It was a pretty solid device. The 4 speakers is pretty cool to ensure you get some real sound out of the device, but the big winner here is the fact it comes with the new S-Pen. Not just some pen that is super small and hides away and is smaller than a regular pen (so your handling is never quite 'accurate'. This pen is a fully fledged 'pen' with its 4000 levels of pressure, it really works like a regular pen for the tablet. This will really help you start to utilize the tabet like it's a real work device.